The cost of mobile phones has come down a great deal in the last few years but has always been more than ordinary phones, or landlines. In the early days the mobile phone operators were able to charge more because the phones were just gimmicks, then they began to be adopted for businesses that were prepared to pay high rates to be able to contact their staff wherever they were. As they began to become popular for consumers, first as luxuries and then fairly ordinary items, competition drove the prices down. But there are many people, in particular those who remember the early days of astronomical call charges, who are still wary of racking up large bills on their mobiles. The two main methods of paying for mobile phone charges are pre-pay, or Pay As You Go (PAYG) or monthly contract. With PAYG you buy credit in advance and then make calls until the credit runs out and needs topping up again. 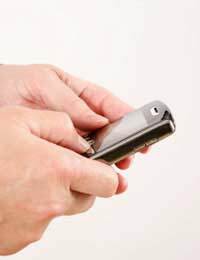 On a contract you pay a set amount each month, which entitles you to a certain number of minutes or texts, and you are charged for any calls or texts over that amount. Pre-pay is usually cheaper, because you can control the amount you pay directly, simply by only using it when absolutely necessary. Also the phones are usually charged for, but you can avoid that charge if you can find a friend or relative who is upgrading and will let you have their old phone. Note that phones are usually locked to one network, so if you want to use an old phone on a different network it will have to be unlocked. The thing to watch is that if you start using the phone to make more calls, you will probably get to a point where a contract phone will be cheaper. The reason for this is that call and text charges on pre-pay phones are higher than on contract phones, so keep an eye on the calls you make and how often you have to top up so that you can compare it with contract charges. Another thing that can help keep costs down is to stop accidentally racking up charges and prevent other people from using it without your permission. Make sure you set a pin code on the phone so that when it's turned on it can't be activated, and consider setting one on the screensaver as well. There are also different settings (known as 'call bars') that mobile phone companies can activate on the phone to prevent certain calls, for example, premium rate or international calls. Many companies set these bars by default, but if you want to make these calls you can have the bar lifted if you call the operator. They will stop any accidental expensive calls. But in the end, the only real way to keep mobile phone costs right down is to not use them. You might then ask what's the point of having one, but there are many people who have a pre-paid mobile phone purely so that other people can get hold of them, or so that they can call the emergency services if they have a problem. Note that if you have a PAYG phone and you use it in this way, you will have to make a call from it every now and then otherwise the company may assume that you are no longer using it and cancel the SIM card. Different companies have different policies on this so it makes sense to find out exactly what the situation is, because it's no fun saving a phone for emergency use then suddenly find you can't make that call.